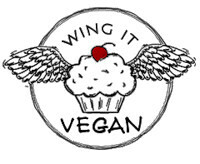 Wing It Vegan: Happy Kitty! A Real-Life Hollywood Ending! Happy Kitty! A Real-Life Hollywood Ending! Who's up for some smiles? Let me spoil the ending of this story for you so you don't have to go through a whole box of tissues while you read it: Kitty Wing-it has found his forever home! Kitty Wing-It is the same Kitty that I told you about on my Spookitty Heads post during Halloweegan. We always thought he was a girl, but he had us fooled. Anyway, Kitty Wing-It had been visiting us for a few months, and lately he had been spending a lot of time with us. He hates being inside all day and he only stayed in when it was really rainy or snowy outside, though after it stopped snowing he liked to jump around in the white fluff chasing imaginary things. Mr. Wing-It and I had to leave town for a couple of weeks, and Mr. Wing-It's mom (Mother Wing-it) was keeping an eye on him. We came back from our trip and went to the Pet Adoption Center to check on him and see if there was anything we could do to get him out of there, though we couldn't adopt him because with us out of town so much he would most likely end up in one of Chancy's traps again. There they told us that his "owners" had actually shown up and surrendered Kitty to them. They told us that he was immediately available for adoption! We saw him in his little cage and it was heartbreaking. This big, lively, mouse-catching, squirrel-chasing, active cat looked like he was all drugged up. He looked defeated. Why do rapists and mass murderers get more cell space than poor shelter animals? Anyway, we came back home and Mr. Wing-It posted an ad on Craigslist's pet listings hoping that someone would reply soon. He posted. We waited. Oh, the agony! There were probably three words said between us while we waited and paced around the house. Maybe they weren't even words, maybe it was just a groan, a sigh, and an unidentifiable guttural sound. Luckily someone did respond after just a few hours! Not just someone, it was Kitty's Fairy Godmother actually! From now on we shall refer to her as Mrs. Fairy Godmother. Mrs. Fairy Godmother sounded unbelievably perfect, and her home sounded like kitty Heaven. At first she thought she wouldn't be able to pick Kitty up for about a week, but she worked things out so she could come earlier to get him out of his tiny cage. Yes, this lady is awesomeness personified and she should be the Queen of Everything. When we met Mrs. Fairy Godmother, the first thing I did was hug her. What?! But I am not a hugger of people! You know, with my social anxiety and germaphobic ways and all. Hopefully I didn't freak her out, I was just so happy and thankful that she was there! Mr. Wing-it said I was very chatty. Chatty?! If you knew me in person the last word you would use to describe me would be "chatty". It must have been all that adrenaline pumping action. I love this one with the autumn foliage in the background. Seriously over-exposed, but one of my favorite pictures. Hey! This isn't a Kitty picture! Not being a complete cranberry-hater anymore, I decided to make some Cranberry-Orange Rolls using my Cinnamon Rolls recipe. I replaced the cinnamon filling from that recipe with 2 tablespoons of orange juice, 1/2 cup of brown sugar, some orange zest and a few cranberries. The glaze on top is OJ + powder sugar and a bit of vanilla. I also added a bit more of orange zest and more dried cranberries on top of the glazed rolls. I hope Kitty's story made you all warm and happy. Thanks to Kitty, we will be visiting the Pet Adoption Center when we come back from our travels and we will try to find homes for as many other animals as we can. Especially black cats and dogs that have a hard time getting adopted. OK, it's time to end this post before it makes "Swann's Way" look like a short story. Thank you so much for all your birthday wishes! *Mr. Bennett to Lizzy in "Pride and Prejudice." Yay for Kitty Wing-it!!!!! I'm so happy that everything turned out for the best! You and Mr. Wing-it are such sweeties for helping Kitty find a wonderful home. And those sweet treats don't look too bad, either! I hope that you have more happy things to blog about and that all the non-happy things stay away! Kitty is such a beautiful cat! She almost looks like a black panther. I am glad she found such a nice home. your story about the kitty made me cry!!! i am so glad it was a happy ending. he is a beautiful cat!!!! How absolutely fantastic! Goes to show there are still wonderful people out there in the world. I'm happy for your post. I must say that I missed you :) My google reader popped you up and I thought, "hurrah! a Friday morning treat!" Welcome back, River! I missed you! I am sooo happy about the happy ending for Kitty! And "all you can catch mouse buffet"--you are hilarious!! 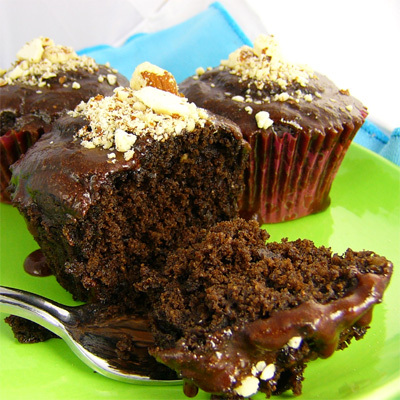 I love that you made the cake into cupcakes--yours look so much more appetizing than the photo in the magazine! Now I'm going to have to try it out your way, for sure. And those rolls look amazing, too. What a happy ending for Kitty Wing-it! I am so happy that you found a home for him. You guys are just as wonderful as Mrs. Fairy Godmother! Glad to see that you are back and I hope you have more happy things to blog about soon. This is so great, major props to you and your husband for being so caring, and to Mrs. Fairy Godmother for rescuing Kitty Wing-It! 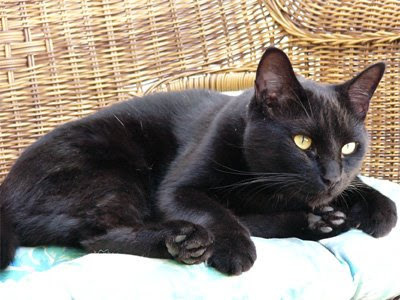 I have a black cat that looks just like Kitty Wing-It (except a little less svelte, hehe) and I can't imagine him not being in my life. He's one of the sweetest creatures on the planet. How someone could shy away from adopting an animal because it's black is soooo silly, but I suppose people in general are rather silly. I hope this post inspires others to go to their local shelters and adopt animals in need, or donate their money or time to helping these animals get placed into loving homes. Wow, what a great story! I'm so happy that kitty found a good home. oh, River - i'm so ridiculouslyhappyfaced for you, Mr. Wing-It, Mrs. Fairy Godmother, and Kitty Wing-It! what a happy ending to such a whirlwind story that could have ended sadly. i'm so glad it ended awesomely! wahooooooooo! might i also add that Ricki's cake-cuppies look most stellar! i've never tried an orange-chocolate combination before. now i know i must! huzzah for some cranberry-orange love, too! mmmmmmmm! oh yes - and i saw that Vegetation had made soy-free tofu & i thought of you! go here for all the yumminess! w00t! i have yet to try it, but Melody did and said it rocks! yay! p.s. - and i'm glad you're back! superhappyface! 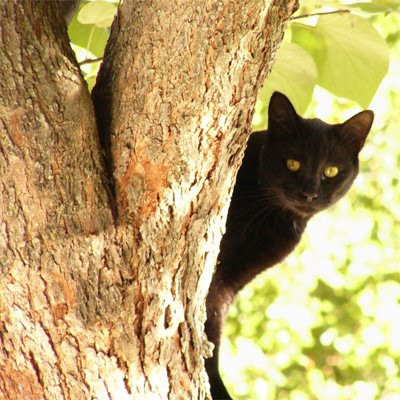 Hooray for Kitty Wing-It... black cats are so superior an special, maybe from all those superstitions? I <3 the pic. 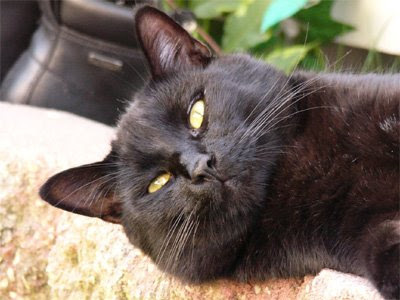 of the plush black cat- also very cute! Um, those choc. fudge cupcakes and orange cinnamon buns look to die for?! :) TGIF!!!!!!! Yay! I love a happy ending! Wing-it Kitty would have loved my home! (If only I didn't live on the other side of the country!) Welcome back to blogland! 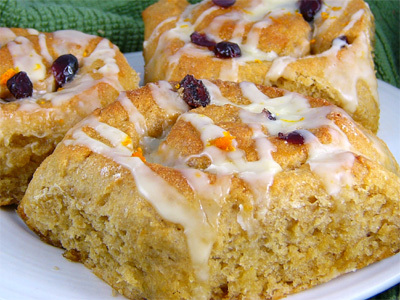 your orange-cranberry rolls look fabulous. I think I'm going to give those a try! Such a wonderful story! I'm so happy for WingItKitty ;-)!! And those cupcakes! Oh my. Welcome back, dear! What a great post...I love happy endings! so happy for the kitty! i needed a story with a happy ending today. your baking looks fabulous as always. keep up the good work! I'm so happy for Kitty Wing-It and Mrs. Fairy Godmother is awesome! I hope that mean old Chancy gets her karmic return for putting poor kitty in jail. Stupid lady. 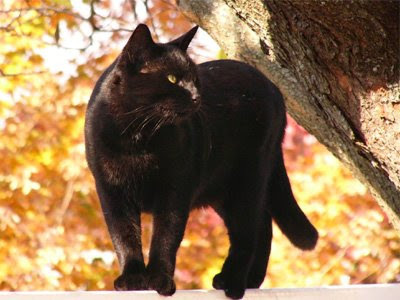 BTW, that pic of kitty with the autumn foliage is absolutely amazing! welcome back! kitty wing-it is adorable! and your baked goods are so tantalizing. can i has some? How AWESOME! I love happy animal stories. You guys were so great to make sure he could find his forever home..
Cranberry Orange Rolls? Yes please! I am so so so happy for Kitty Wing-It!! That is such great news, what a weight off your shoulders. I got my cat from a family when I was living in Hawaii, who were leaving and worried they were going to have to bring her to the humane society where they unfortunately euthanize animals quite often (small island, lots of animals). Um...and both your baked good looks super super awesome. YUM. Nice save the kitty post! You are a superstar! 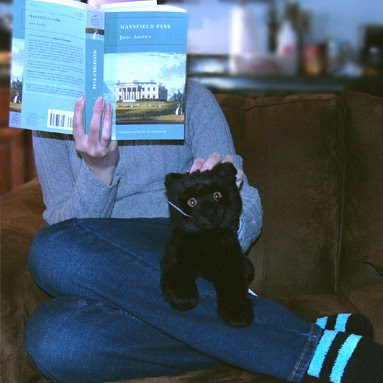 I pre-ordered Lost in Austen from Amazon...it comes out in April, and the wait is killin' me...and, er, I'm rereading Pride and Prejudice on my kindle currenty. I got the whole Austen collecton for like 99 cents. Welcome back to the blog world! Glad to hear of the happy ending! Such a pretty cat. Kitty Wing-It has a twin at our house. He started visiting a month ago. He looks just like yours, except that he is very obviously a boy. He is doing a good job at making friends with the resident cat, which isn't easy because resident cat suffered starvation as a kitten and sees other cats as foes in the survival game. 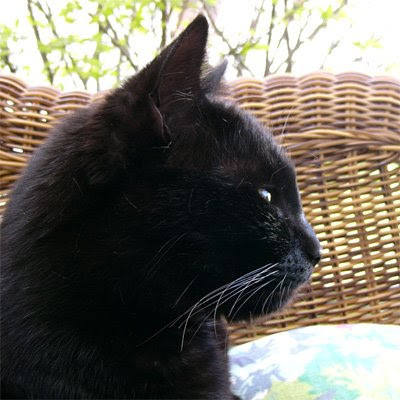 But it looks like the lovely black cat is here to stay, so he'll be going to the vet for a check-up and getting a name soon. I missed you. big hugs!! I am so glad that you were able to help the kitty find a good home. As always your food looks amazing. I wish I had some cinnamon rolls right now. Hi River. Thanks for the link to Melody's blog! Wow, she's inspiring! thats the most beautiful story i've ever heard!! I am so glad kitty found a home!!! Jane Austen is on my list of people to invite for dinner too! 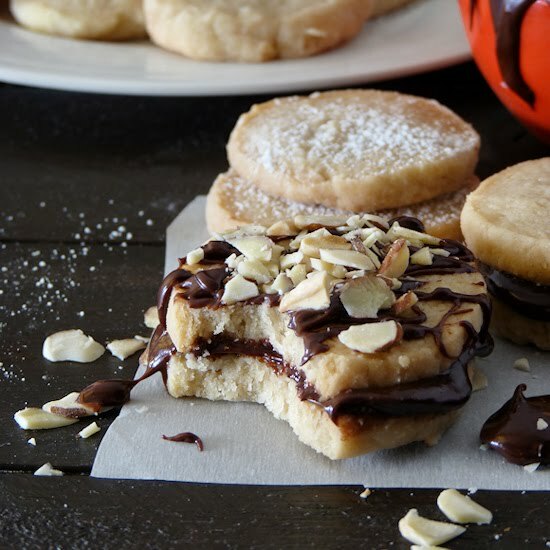 omg make some madelines then you can be all the swann's way ya wanna be!! 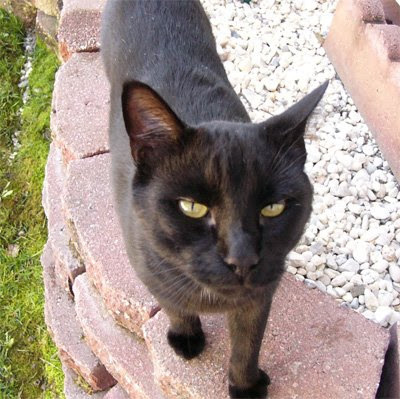 what a happy bappy post for kitty wing-it...he does look an awful lot like salem from sabrina teenage witch.awwwwww such cute pics! sorry to hear abt the less than stellar meals though i know you're being humble...woman u have talent! pure talent! I'm so glad you're back!!! Any blog post with a Proust reference is cool in my book, but a post with a wonderful, happy ending like this one is just right on amazing! I'm so glad that kitty found a happy home, and that is a big weight off your shoulders. Those kitty pictures are just so beautiful - I really love that last one, and your yummies look, well, yummy!!! River! I just have to run and hug my kitties extra hard **** ok, I'm back. You are awesome. You and Mr. Wing-it are so good for finding Kitty wing-it a home, and evil death glares to Clancy. (jerk, jerk, jerk). Lizzy bennet would totally dig your tenacity in this situation! here's to all the chocolate cuppies in the world. YOU are awesome for looking after Kitty Wing-it! I love happy endings. And I love the looks of those treats! I'm so happy for kitty! I just love those pics of him! You're awesome for finding him a home. Chancy is a bad person and needs a taste of her own medicine. I've got to try those cupcakes. they look so good! V.good to hear Kitty Wing-it found a lovely home! And those orange rolls look delicious! Those pictures are absolutely adorable. I love to hear that there is a happy ending to the story. I want a pet quite badly and almost give in everytime I go to a shelter but with my travel schedule and tiny condo it's just not fair. Your kitchen creations also look delicious as always. Wow River! What an amazing, just beautiful story and gorgeous little kitty creature. Thank you for you kind words on my blog. You are the sweetest blogger in all the land. That is such a great story. I am so glad Kitty Wing-It found a home. I have your gift. Sorry I have not mailed it yet. The boys Nana had knee surgery last Thursday so I have been in and out checking on her. I will mail it next week. Glad you are back blogging. Holla, Kitty Wing-It!! Chancy better watch her back! Word. Looooooove the goodies!! They look so scrum-diddly-umptious! I can see that you have many many comments on this one! That's because it looks amazing! Hope you're having a great day my far-away friend. What a wonderful thing to do for "your" Kitty! I'm sure he'll be very happy thanks to you. I'm glad Kitty Wing It has found a home! And, of course, your cranberry orange rolls look divine! Yay Kitty Wing-It! I'll take a roll, please. Hooray for kitty! You are so kind to help him. Yay for fairy godmothers everywhere! love, love, love the story! i don't understand why black animals don't get adopted. we adopted 3 black collie/lab brothers from a shelter & love them dealy! 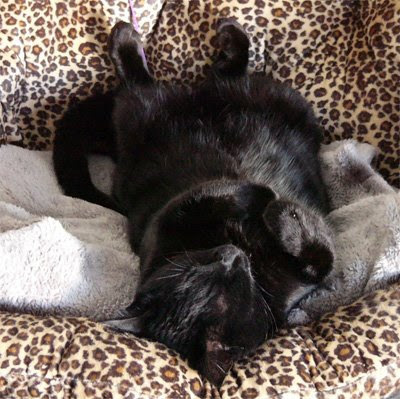 we also have a 14-year old tempermental kitty named rascal lovebug sassy martin dietrich! i love your blog; i just saved it under blogs to read. i am really looking forward to trying your cinnamon roll recipe! you even used whole wheat pastry flour, a woman after my heart! i look forward to more great posts! thanks! I love you for taking Kitty-Kat under your wing and helping him find a good home. Kitty wing it is sooo cute!! the orange rolls look amazing!! God - I was crying whilst reading that and it was meant to be happy! It IS happy. I'm so happy for kitty wing-it . He's so beautiful and I love the picture of him playing peek-a-boo round the tree. Mrs Fairy Godmother truly is awesome and people like her restores my faith in mankind, and womankind and Fairy Godmotherkind. Welcome back to the blogosphere, I've been MIA for a while too but I'm back now. Cakes and Orange Rolls are a purrrfect way (hee hee hee) to finish up with. 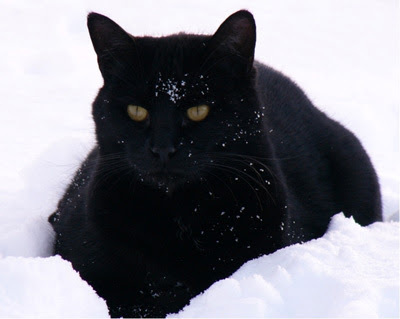 What a beautiful panther of a kitty! Aww your cats are adorable. My cats hold a dear place in my heart as well. I'm drooling over those orange rolls!